On a long journey to...New Orleans! 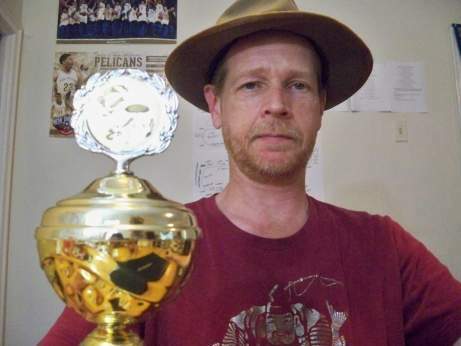 One day, Pete advertised a new tournament to the RZA community- The IECC2. 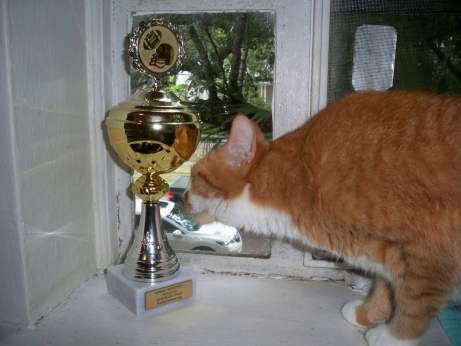 I had never participated in a friendly cup before but somehow I found the uniqueness of this tourney to be irresistible, as the winner would actually receive a physical trophy. So in a moment of impulse I joined, not really thinking I had a chance to win my group, let alone prevail over 64 other teams to collect the trophy. Somehow, each win continued to be followed by another. Surprisingly, I won my group of 8 and received some credits as a reward. Then it was on to the finals, where I was sure I would finally meet defeat...But although some games were severely contested, my Myst1cs kept winning! The most exciting game was vs The Notorious Pub Gang, in which I was down 17-3 at the half. But my Myst1cs came roaring back in the second half, taking a 3-point lead with 3:43 remaining in the 4th. Pub Gang then drove to my 30 yard line and set up for a tying field goal attempt with only 51 seconds remaining! But the 47-yard kick was missed. Eventually, the 10th and final game was played, and it was another win. This was completely unexpected to me. Nobody was more surprised by this than myself. I received another nice pile of credits, as well as congratulatory messages from several of the fellow competitors I had been so lucky to defeat along the way. A few weeks after that, a box arrived at my door, all the way from Germany. Inside was shiny trophy and a very nice letter from Pete. This was the most incredible experience I ever had from playing an online game, and second place isn't even close. 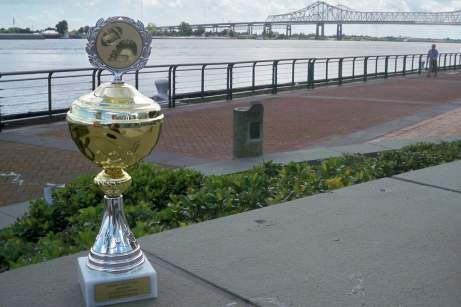 When the trophy arrived, the first thing I wanted to do was give it, and the RZA community, a tour of my fair city- New Orleans, the Big Easy, the Crescent City. ​The first stop: The mighty Mississippi River. It was in taverns and juke joints up and down this river that the Blues was born. 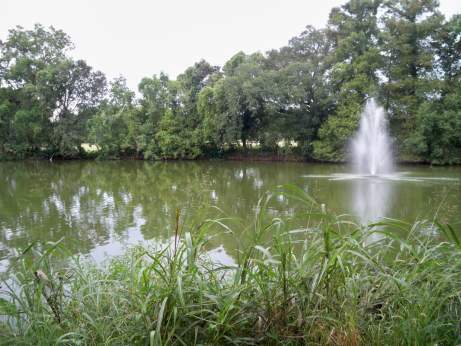 Some of the earliest jazz musicians out of New Orleans, such as Louis Armstrong, played on steamboats which traveled up and down this river. 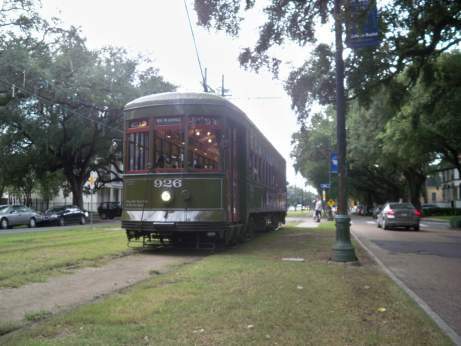 Next stop: Jackson Square, in the heart of the French Quarter. 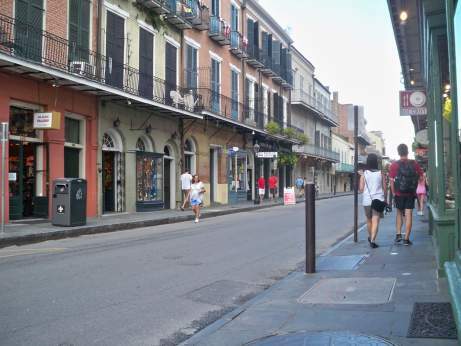 New Orleans is known for its street scene, which features artists, musicians and street performers of all kinds. St. Louis Cathedral towers over the square. ​Many of the buildings in the Quarter date back to around 1800, with some as old as 1750. Chain commercial enterprises (McDonalds, Taco Bell, etc.) are not allowed in the Quarter. Also, there are no electrical wires above ground. This helps the Quarter to maintain its old-world feel. 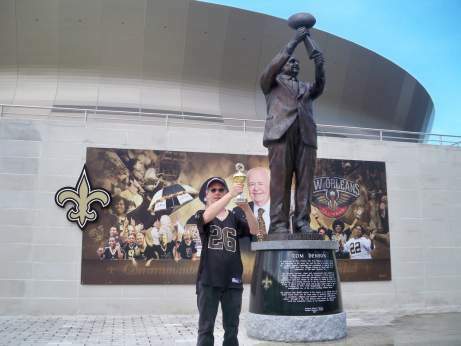 In front of the Dome, we see the Steve Gleason statue. The recent film "Gleason" is about this incredible man. Gleason is a former Saints player and a New Orleans hero. My wife and I were at the Monday night game vs the Atlanta Falcons when this blocked punt occurred, September 26, 2006, the reopening of the Dome after Hurricane Katrina. 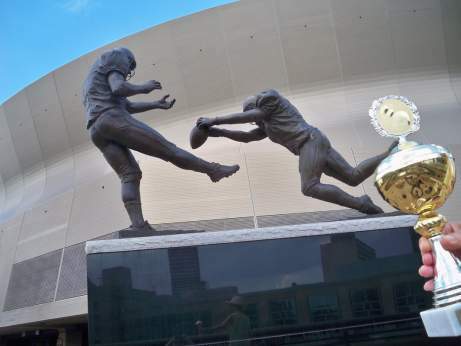 I've always felt some sympathy for the punter who is perhaps unwillingly immortalized here. 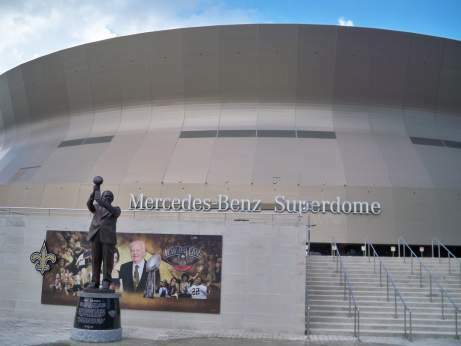 A little known fact about the Superdome: it was literally built upon an old cemetery. When construction began, the workers quickly discovered the graves and had to move them in order to proceed with construction. 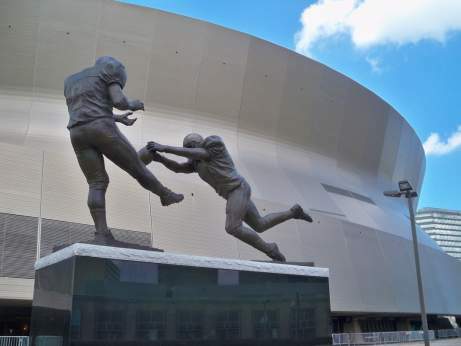 This has led to speculation that the Superdome was cursed from the beginning, leading to the Saints' 20 years of struggle before finally achieving their first winning season in 1987. Now it was time to catch a street car home. 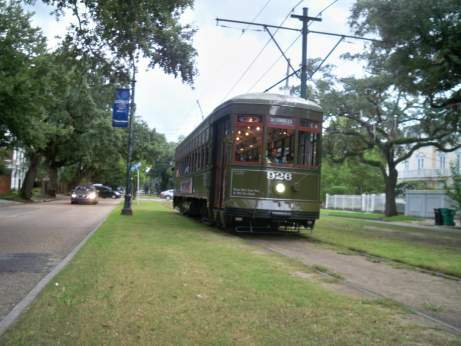 The St. Charles streetcar line has been in operation for more than a hundred years and is now a National Historic Landmark. 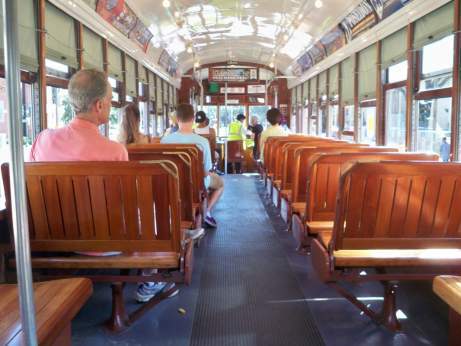 These cars are still built and operated in much the same way that they were originally. Most of the major Mardi Gras parades roll down this avenue- if you look closely you can see beads still hanging from the wires and trees, like permanent decorations. 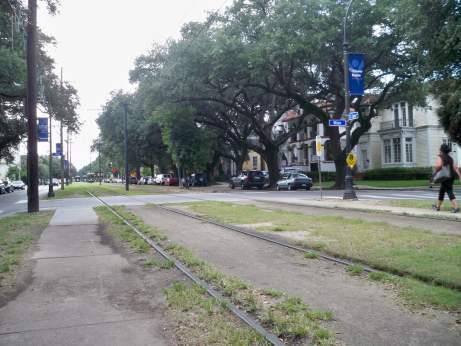 I ride this streetcar line to and from work. I suddenly realized I needed to stop for a bottled water...It must be fate! And then we were back in my neighborhood- Uptown, New Orleans. 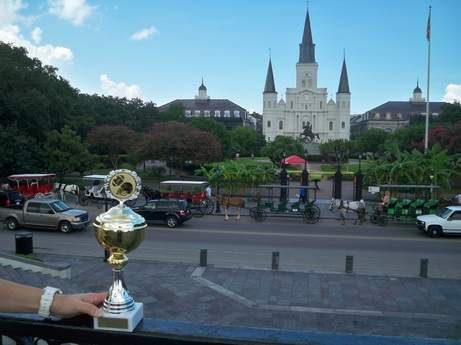 I used to live just outside of the French Quarter but as I grew to my ripe old age, peace and quiet is what I craved. 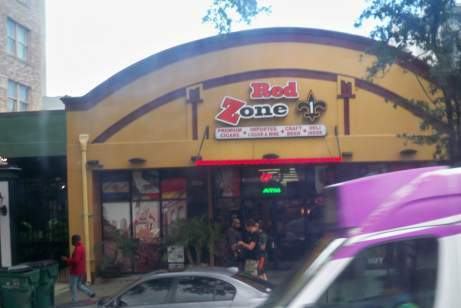 Uptown is very quiet (until Mardi Gras rolls around). I live near Audubon Park. 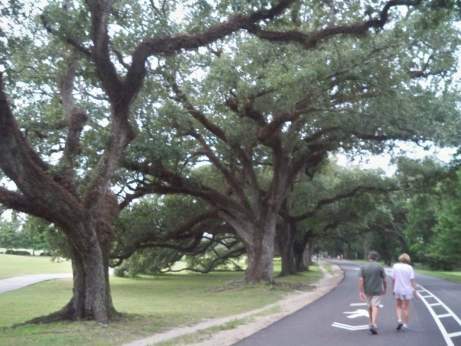 As you can see, giant oak trees tend to dominate the Uptown, New Orleans landscape. 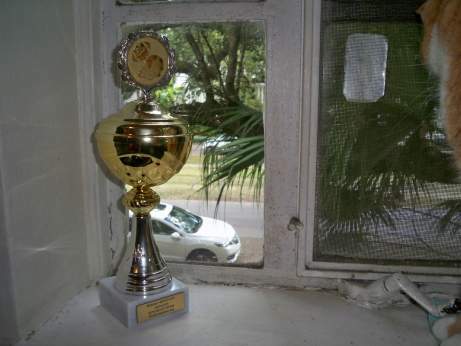 And here my trophy will reside, next to the window overlooking St. Charles avenue, a permanent reminder of the day I won "all the marbles." 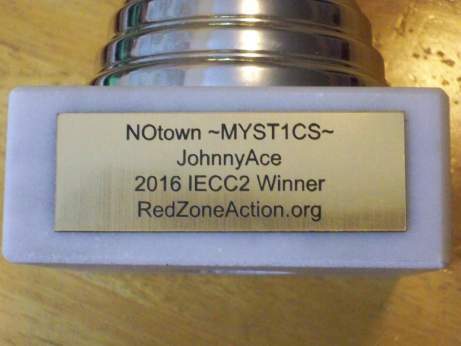 Participating in the IECC2 was a thrilling experience from start to finish. Some games I had time to prepare for, some games I didn't. Sometimes I was expecting to lose badly, yet somehow, my team pulled through, time after time. I sincerely thank Pete for this awesome experience and a very cool trophy!